Street View: 1 and 18 Suppl. For the purposes of this blog, the King William Street entries are the most relevant. 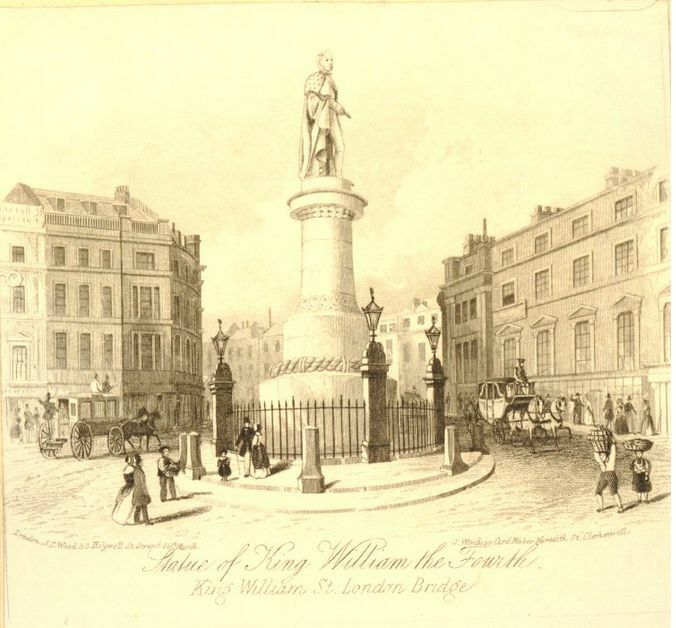 A whole neighbourhood had been razed to the ground for the construction of the new approach road to London Bridge, named after King William IV. The plan above shows what happened. 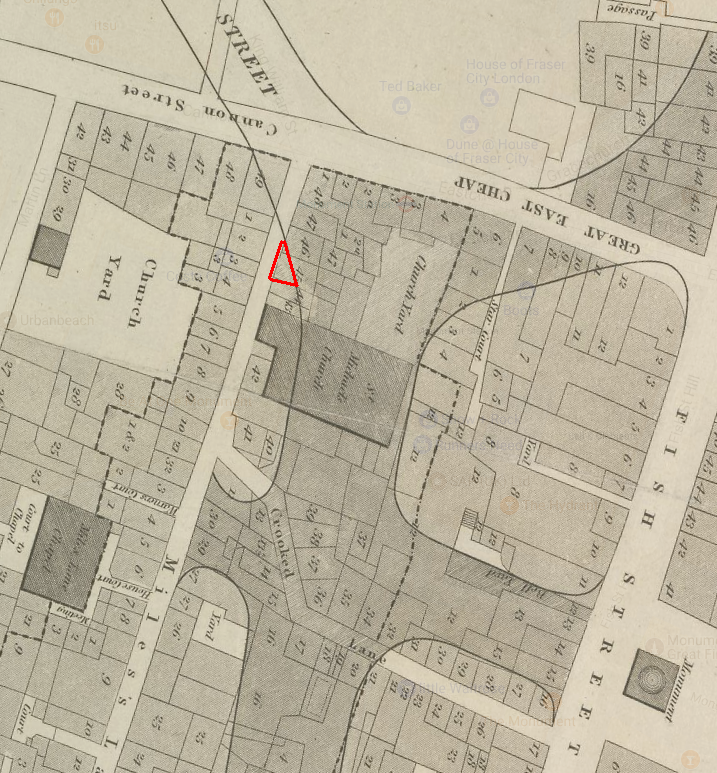 The darker area is the outline for the new King William Street and outlined in red is the property that became Mountcastle’s hat shop. If we look at the Land Tax records for 1833, the houses in the area are bracketed together and listed for the New London Bridge Committee. In 1836, however, Mountcastle’s name appears as one of the occupants of the “redeemed” properties. 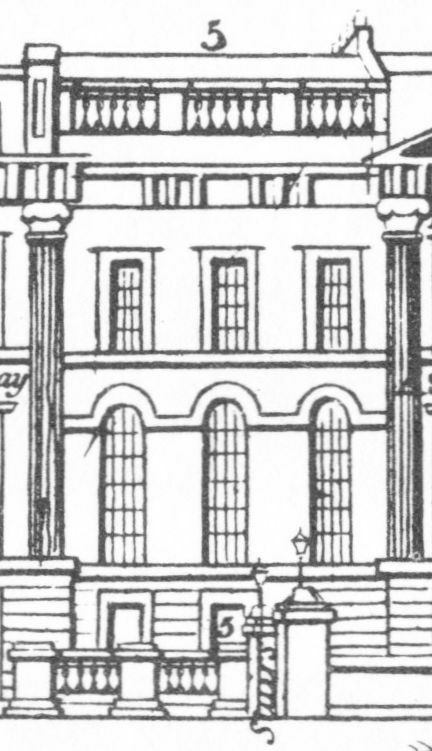 In one of their advertisements, Mountcastle’s neighbours, George and John Deane, ironmongers at number 46, display their new shop and say that their “present premises” were erected in 1833, so presumably that was also the year in which number 41 was erected as it is situated in the same block of houses. In 1841, Edward and Frances are listed in the census with their 3-week-old baby Charles. Although the three children who were born after the 1841 census were all baptised together in 1845 in Camberwell, it does not necessarily mean that Mountcastle gave up his shop in King William Street. 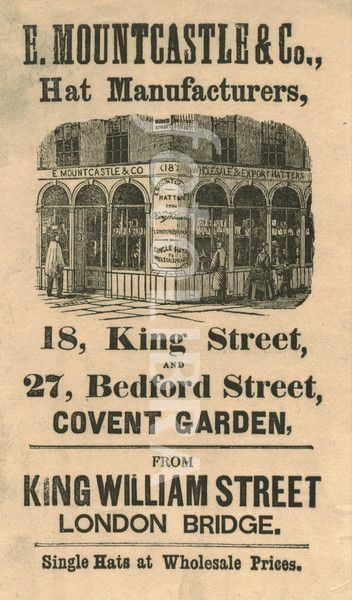 In the 1843, 1848 and 1851 Post Office Directories, 41 King William Street is still the address for the hat shop. 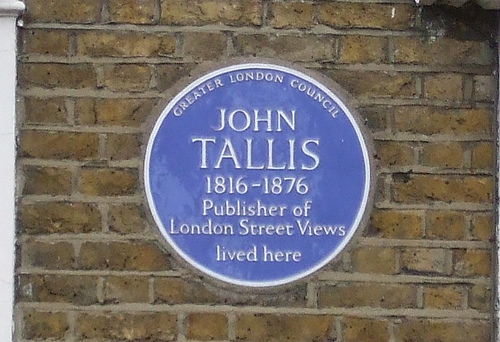 And Tallis in his 1847 Supplement also still listed Mountcastle at number 41. Only in the 1856 Post Office Directory was he listed at 22 Cannon Street. And at some point, he even had a shop at 10 London Street, Greenwich. The census returns for 1851 shows the family living in Greenwich, while at King William Street we find William Haldin(? ), a carpenter, which seems conclusive, but the tax records tell a different story. There, Mountcastle is only listed for King William Street till 1844. There is a gap in the records, so the next year available is 1847 and Mountcastle is no longer there, but one Robert Wass is paying the tax. 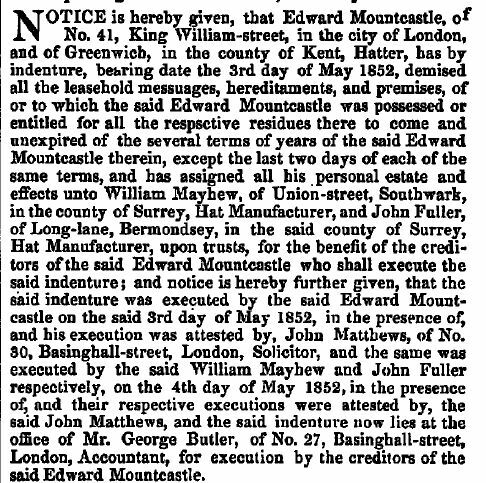 However, in 1852, bankruptcy proceedings are started against Mountcastle and he is still described as of 41 King William Street and London Street, Greenwich. At some point in 1852, he signs over his leasehold properties for the benefit of his creditors. I am guessing that Mountcastle rented out (part of?) his 41 King William Street property and tried to raise money that way when things got tough in the 1840s. As we saw in the 1856 Post Office Directory, Edward could next be found in Cannon Street where, at the end of 1856, he dissolves a partnership with one William John Rushby. The gentlemen had been trading as hatters under the name of J. Jenkinson and Co.(2) In the 1861 census, Edward, Frances and four of their children are found at 276 Albany Road. This may have been the same property as the one listed in the baptism record of Mary Ann, but as that does not give a house number, it may be a different house in the same street. At some point Mountcastle must have had a shop on the corner of King Street and Bedford Street, Covent Garden. It is, however, unclear when and for how long that was, but it was certainly after he had been at King William Street. Edward died in 1867 and the registration district is given as Strand, so he was possibly still living in Soho. I tried to find out what happened at 41 King William Street after Mountcastle left, but as the tax records do not provide house numbers, that it is not so easy. We saw that the 1851 census for the parish of St. Magnus the Martyr listed Harlin the carpenter, and in 1861, it is one Edward Hart, a hosier, who occupies the premises. Ten years later it is Alfred Hayward, a customs officer, who lives at number 41, and in 1881 one William Taylor, a tobacconist’s manager, but none of these people seem to appear in the Land Tax records, so presumably they were all renting. 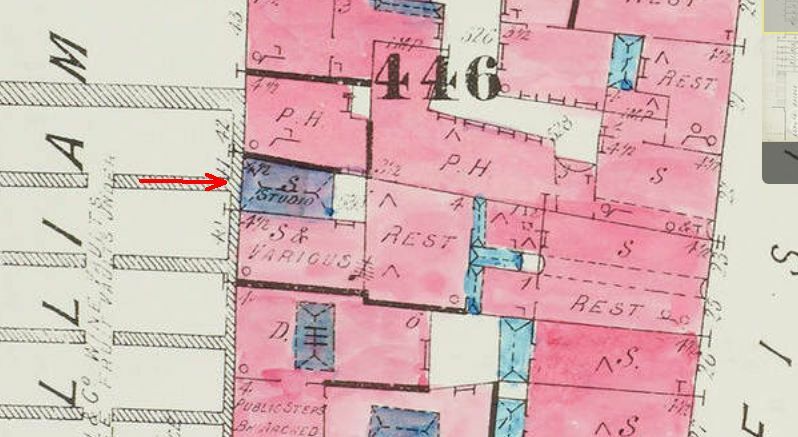 Goad’s insurance map of 1887 lists the property as a ‘studio’, and it still looks as small as when Mountcastle lived there. 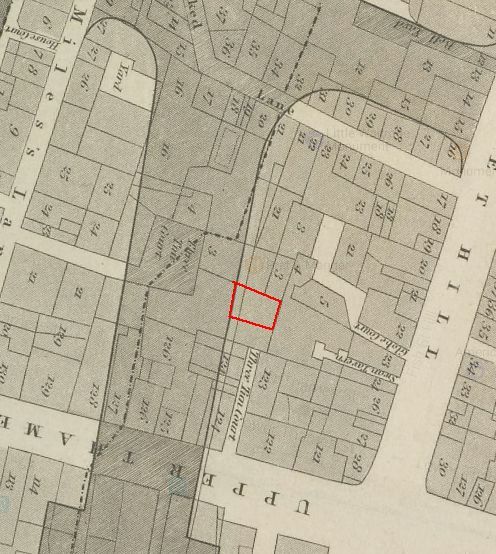 The northern end of the block, that is, number 46, was taken over in 1890 by the City and South London Railway Company for their King William Street Station, but it was not to last. 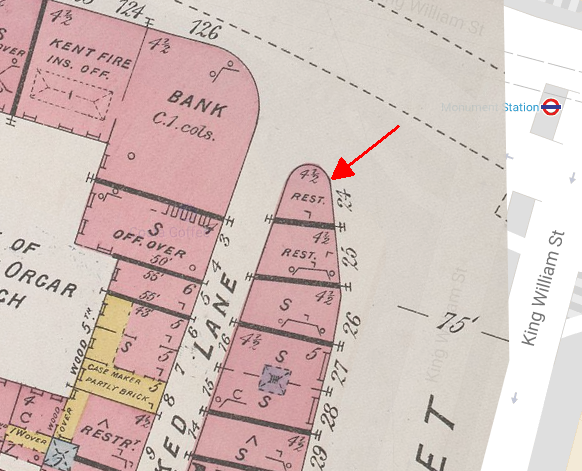 The station was closed in 1900 (see here for more information) and Regis House was built on top of the station, not just obliterating the station entrance, but the whole block of houses from numbers 40 to 46. The Regis House you see today is a modern replacement from the 1990s, but they have retained the access to the platforms of the station which was used as an air-raid shelter in the war (more information and photos here). (1) Sidney’s father William was the brother of Edward’s father Montague. (2) The London Gazette, 2 January 1857. Adelaide Place was the broad section between King William Street and the north foot of London Bridge. It was named after Adelaide, the wife of William IV. On the west side, Fishmongers’ Hall can be found; on the east side a large building was constructed in c.1835 which was divided up into several offices. 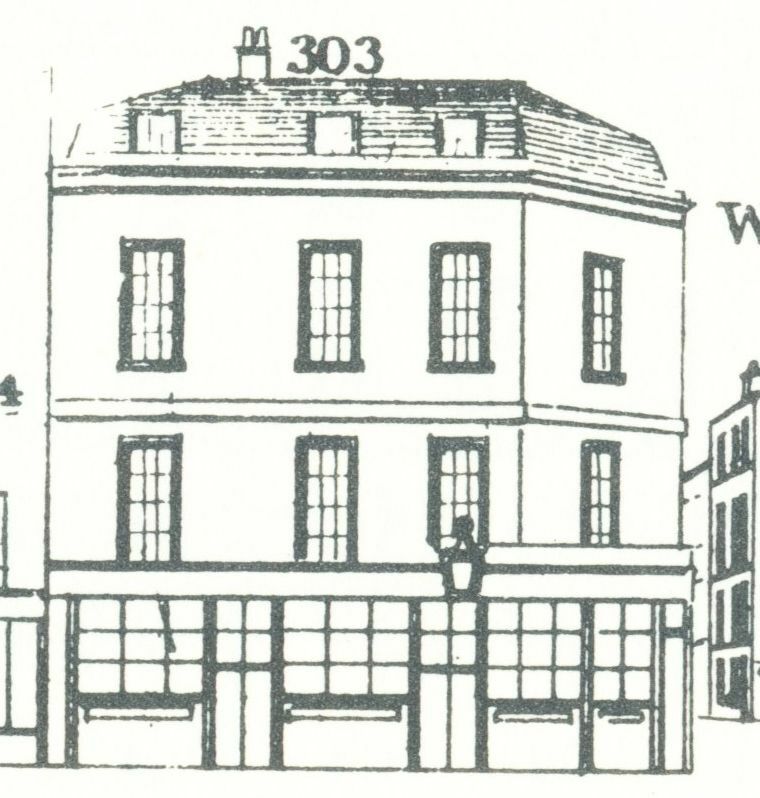 Number 5 Adelaide Place, where Waring and Moline had their office as agents for Guinness, was, according to Tallis, also occupied by a Mr. Field (first floor) and a Mr. Chadwick (second floor). Although these two gentlemen were not given an occupation by Tallis in the first lot of Street Views (±1839), they were still there in 1847 when the second batch of Street Views was published and although Chadwick still does not have an occupation, at least he is given the first name William (was he the architect John Belcher was apprenticed to?). Mr. Field is James Field, architect & surveyor. 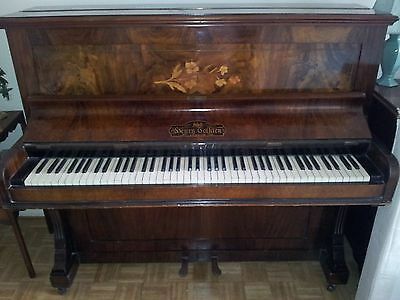 In 1847, we also find John Belcher, architect, at number 5, but Moline has disappeared from the Tallis Supplement list. Not so in reality, however, as he was certainly there until his death in 1865. The years from 1836 to 1840 were turbulent years for Moline. In November 1836, his father John Sparks Moline died. He was buried at the Quaker burial site at Winchmore Hill, Enfield, and the burial record gives Adelaide Place as his address and “porter merchant” as his occupation. Father and son may have been in partnership together with Waring, although the records do not make that clear. 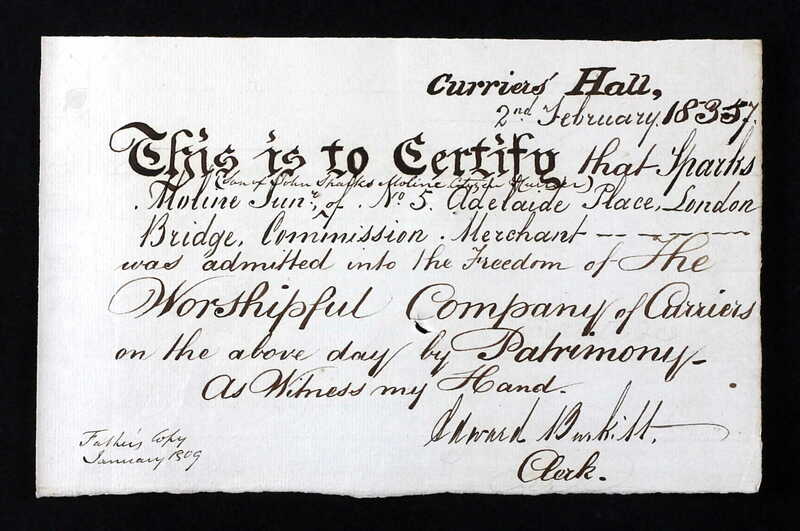 A few months later, on 2 February 1837, Sparks received the freedom of the Company of Curriers by patrimony. Next comes the end of the partnership with Waring and later that same year, on 8 November 1838, Sparks marries Isabella Prideaux at Kingsbridge, Devon. She unfortunately dies on 4 October 1840, just two weeks after their daughter Isabella Prideaux Moline is born. She is also buried at Winchmore Hill. The 1841 census lists Sparks in Llandygai, Caernarvonshire. Not sure what he was doing there, but with him is a Mary Moline, one year younger than Sparks, so she may very well have been his sister Mary Waring who was born in 1812. In 1855, Sparks’ younger brother, David (1814-1864) had taken out a patent “for the manufacture of metallic window frames and skylights”. 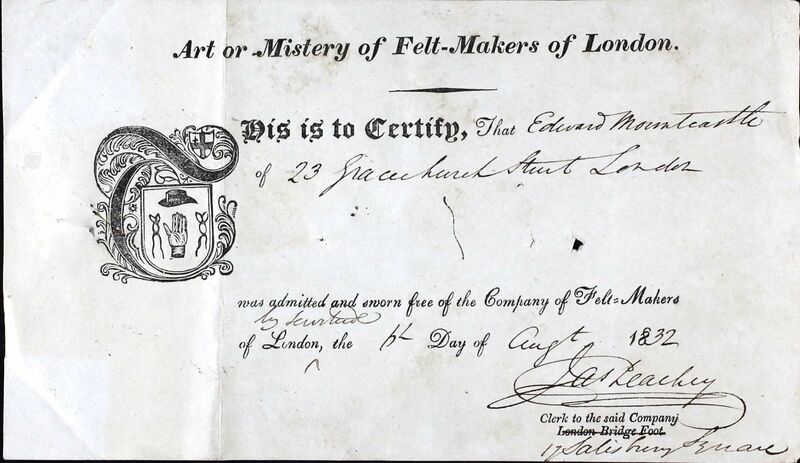 (3) In 1856, David obtained his freedom of the City (by redemption) and is then classed as “porter merchant” of 5 Adelaide Place, suggesting a partnership with Sparks. How is that for a career-change? When the partnership between the brothers was officially entered into is unclear, but it was dissolved on the 31st of December 1861. (4) Somewhere in the early 1840s, David had married an Austrian wife and they lived in “Laybach, in the empire of Austria” as his probate record would have it. David died there in 1864 of typhoid fever. (5) Laybach, by the way, is usually spelled Laibach and is better known as Ljubljana, these days the capital of Slovenia, but then part of the Austrian Empire. A train service between Ljubljana and Vienna had been established in 1849, so not too far an outpost to be living in. 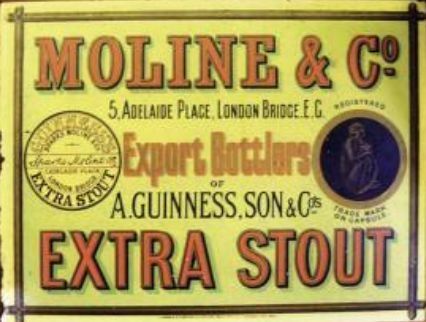 Moline & Co. continued to act as the sole agent for Guinness, a privilege they frequently had to defend when others tried to encroach on their territory. 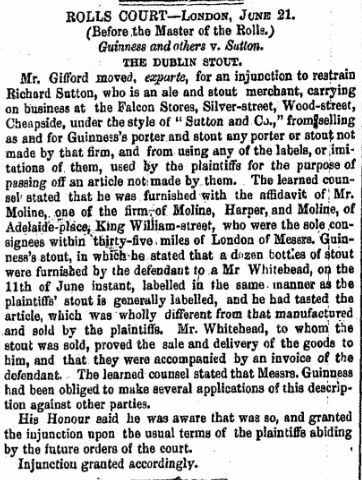 In 1846, an injunction was taken out by Guinness and Purser against Hill and Coulson, to stop them “selling or otherwise disposing of any stout, porter, or other malt liquor in bottles with labels in imitation of the labels furnished to the plaintiff’s agents by Sparks Moline, or differing only colourably therefrom”. (6) And in 1853, it was Richard Sutton of Wood Street who fell foul of Moline’s monopoly. 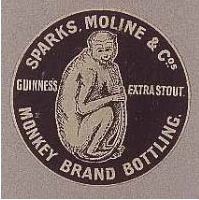 The agents and bottlers Guinness used were allowed to put their own trademark on the bottles and Moline’s was a monkey. The “monkey brand” was advertised as far away as New Zealand where Arthur H. Nathan advertised the beer bottled by Moline in The New Zealand Herald of 16 August 1889. 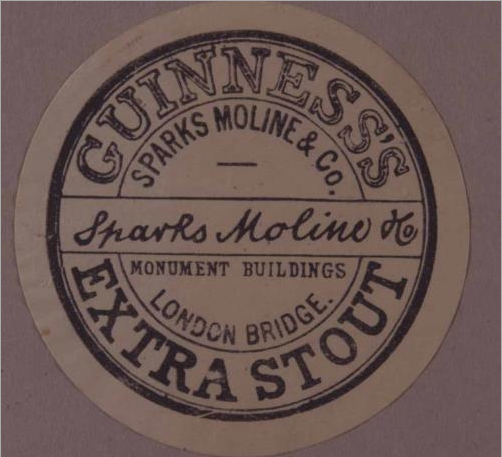 At some point, Moline & Co. moved the business from Adelaide Place to Monument Buildings and from just acting as the London Guinness agent, the firm also became an exporter of their ‘own’ bottled Guinness. Sparks Moline died 28 November 1865 at Church Row, Stoke Newington, and, although he had been a Quaker all his life, he was privately baptised at St. Mary’s a few days before he died. He was nevertheless buried at Winchmore Hill. And he was not the only one who seems to have had a change of heart. His daughter Isabella Prideaux was baptised on 26 June 1861, also at St. Mary’s, and so were Sparks’ sisters, Lydia and Mary Waring, both on 16 January 1866. The unmarried sisters, their mother and their unmarried niece continued to live at Stoke Newington. (7) Despite sister Lydia’s baptism at St. Mary’s, she was buried in 1891 at Winchmore Hill, the Quaker burial site, so I am not sure what was going on, but perhaps it was another example of what the Friends mention on the Winchmore Hill website, that is that “The nineteenth century saw the defection of most of the more prominent business families, as the delicate balancing act between Quaker ethics and the demands of hard-nosed capitalism became increasingly difficult”. You may notice that Quaker registers do include non-members (there’s a “N.M.” column in the 19th century Digester registers), and you will as in this case find non-members in Quaker burial grounds. Two common reasons for these non-member entries is in the case of disownment (as happened to bankrupts, for instance), or when children did not have “birthright” membership because only one of their parents were in membership – yet the individual or family maintained a close association with the meeting. In the case of close family ties one can see how easily the continuing association could lead to an entry in a burial register after a death in particular. Regulations adopted by yearly meeting 1774 provided that ‘when any person, not a member of the society, is permitted to be buried in friends burying-ground, it is to be noted in the margin of the register’. The book of discipline adopted in 1833 made more explicit provision for ‘one or more proper person’ to be appointed by the monthly meeting, without whose authority ‘no burial is to take place’: as far as the burial of non-members was concerned, discipline stated that ‘Friends are to exercise discretion in complying with any application’. In the case of Sparks Moline, his entry in the post-1837 Digest registers clearly states that Sparks Moline, Commission Agent, of 6 Church Road, Stoke Newington, died 28.11.1865, aged 64, and was buried at Winchmore Hill, 5.12.1865 – and that he was N.M. (not in membership of the Society of Friends). (1) David Hughes, “A Bottle of Guinness Please”: The Colourful History of Guinness (2006). Hughes also mentions Sparks Moline at Billiter Street, but that may have been the grandfather of Sparks who was also called Sparks. The grandfather applied for the job of bridge master in 1824 and asked for the support of his fellow liverymen in an advertisement in The Times, sponsored by Samuel Gurney and William Fry, both Quakers. (2) Patrick Lynch and John Vaizey, Guinness’s Brewery in the Irish Economy 1759-1876 (2011), p. 132-134. 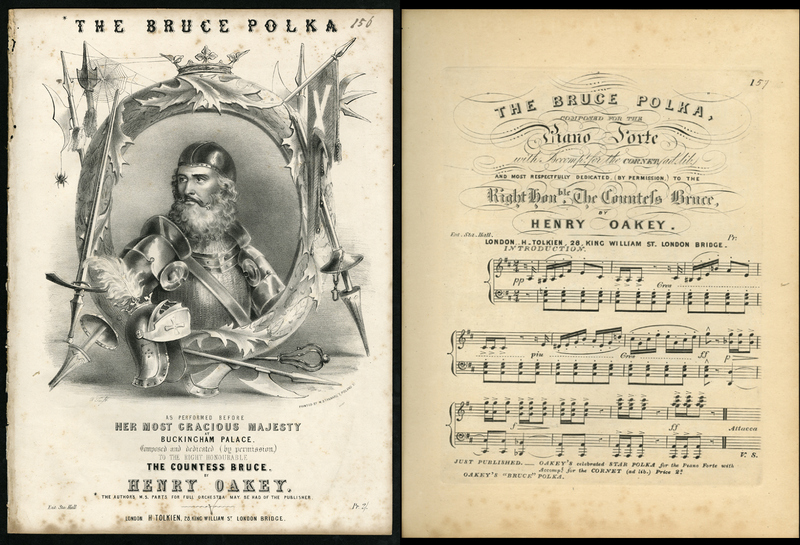 (3) The Repertory of Patent Inventions (1855). For a description of the window frames, see here. (4) The London Gazette, 24 January 1862. (5) Illustrated London News, 15 October 1864. (6) Rolls’ Court, The Times, 26 March 1846. (7) More on the family and their Quaker ancestors can be found here. Eventually, Ridgway & Co. specialised in just tea, tracking down new varieties from all over the world to use in their high quality blends. In 1886 they received a request by Queen Victoria for a personal blend and they were later appointed tea merchants to King George VI. Ridgway’s became one of the first tea companies to sell their produce pre-packed against adulteration. Thomas was born in 1802 in Lymm, Cheshire according to the 1851 census which sees him living with his wife Lucretia, a butler, a cook, a housemaid, a laundry maid and a nurse at 27 Oxford Square, London. However, on 3 June 1855, the couple were both baptised in North End Baptist Chapel, Towcester, Northamptonshire. The chapel had been opened in October 1853 and was built on land belonging to Thomas. (1) London Gazette3 September 1830. (3) Eliezer Edwards, Personal Recollections of Birmingham and Birmingham Men (1877), unpaginated. 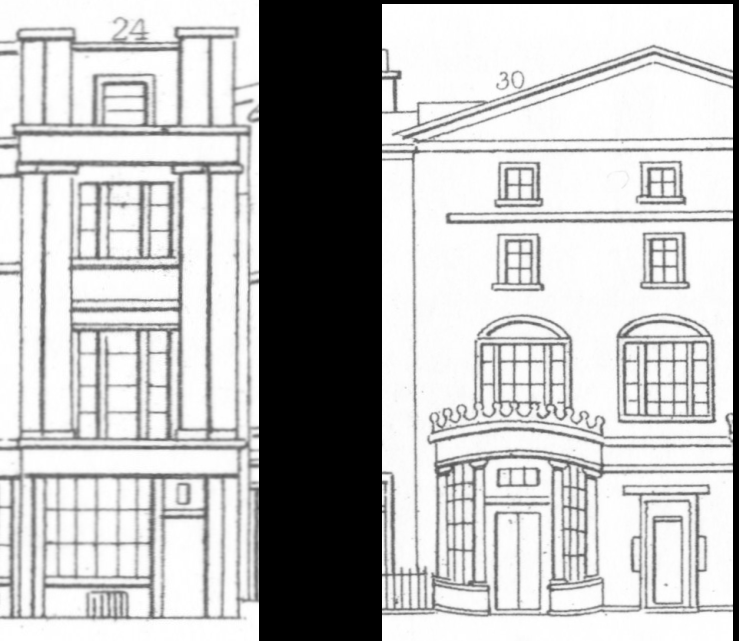 (3) Street View 15 and 16 of the 1847 Supplements. 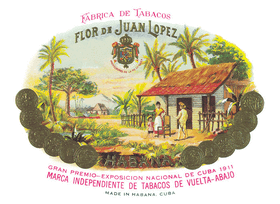 (4) T. Baring, Adulteration of Coffee. A verbatim report of the proceedings of a public meeting held at the London Tavern on Monday, the 10th of March, 1851. London (1851); Hansard Commons Debate 5 June 1851 (vol 117 cc510-33). (7) England & Wales, National Probate Calendar (Index of Wills and Administrations ), 1885.